Hurry over to Coupons.com and print this $6/2 Schick Disposable Razors (excluded 2 ct.). You can score 2 FREE packs of razors at Walmart! Total = FREE + $2.06 moneymaker @ Walmart! 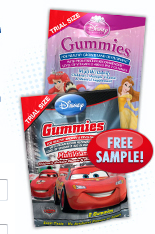 Head over HERE and request a FREE sample of Disney vitamins. Choose either Cars or Princess. Head over to Coupons.com and print all the razor and shaving cream coupons. You can score some FREE razors at CVS and Walgreens next week (starting 9/25). Print this coupon and use it starting tomorrow at Walgreens for a good deal. Head over to the Krystal facebook page and "like" them, then click on the "Free Strawberry Shortcake" tab to print a FREE coupon! Please share this post with a friend so they can find out about this freebie too! Hurry and print this coupon before it's gone and it will probably be gone fast! Save it to use at Walgreens starting Sunday 9/25. = $1.01 MONEY MAKER after coupon and Register Rewards!